Ministry of Propaganda - 27/Aug/2007: "London -vs- Hatterrall Hill, Wales"
London (Paddington) is just over an hour by train from Swindon. I had to visit the German Embassy to apply for a new German passport (as a German living in the UK a visit to the embassy is the only realistic option to renew my passport). So I jumped on a train as soon as the saver ticket fare allowed it and arrived in London late in the morning. Just before the embassy closed at 11:30 I walked into the passport office at Belgrave Mews West. By about 13:00 I finally had my application completed after more than an hour of waiting in the queue. Now I had the afternoon left for some exploring of London. I took the London Underground to Covent Garden, where I had lunch at the Opera Tavern Pub. Quite nice burger for a reasonable price. The rest of the afternoon was spent wandering around London. An aimless attempt at some shopping until I realised that I didn't need or want anything. 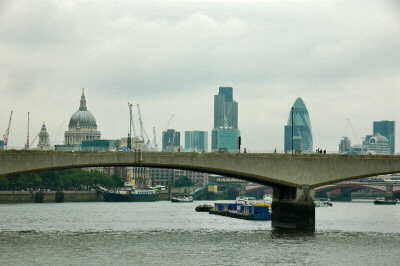 The weather admittedly didn't help, but I couldn't help finding London grey and depressing, all the concrete, dirt, noise, hustle and bustle. Despite a very good forecast the weather on Sunday morning didn't look very promising, it had clouded over after a beautiful early morning. But just before noon the clouds started to break up again and I decided to give it a go. It was the right decision, by the time I arrived in Llanvihangel Crucorney it was a beautiful mild sunny late summer afternoon. 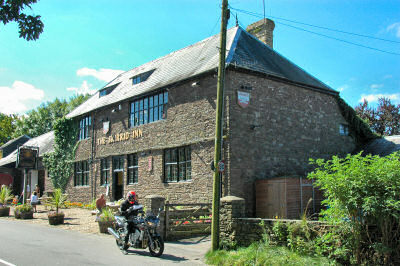 I parked near the Skirrid Mountain Inn, where I planned to eat later in the evening. On went the walking boots, I grabbed the backpack and the camera bag and I was off to Hatterrall Hill (or Hatterall Hill, I've seen both spellings). I crossed the Afon Honddu at Pen-y-bont, then climbed up the hill to Great Llwygy and on to Groes-lwyd. 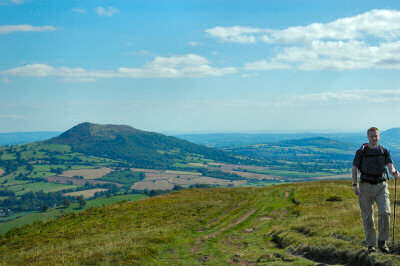 The Beacons Way, soon combined with the Offa's Dyke Path, took me up to Hatterrall Hill. 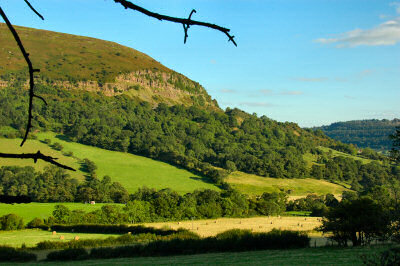 The views were very nice, among others looking back towards Ysgyryd Fawr. There were skylarks, ravens, bees and some ponies (I think wild ponies, to my knowledge there are wild ponies in the area). A few other walkers, but not as many as I had expected considering the great weather and the bank holiday weekend. A late lunch was enjoyed at a trig point near the path, I also used the trip point as an improvised tripod to take a picture of me walking up the hill. It was very quiet and peaceful up here, except for the (luckily short) moments when a motorbike with a high powered engine was screaming along a road somewhere in a valley. How easy just one person can spoil something for many. Refreshed I continued along the path, enjoying fantastic views in all directions. 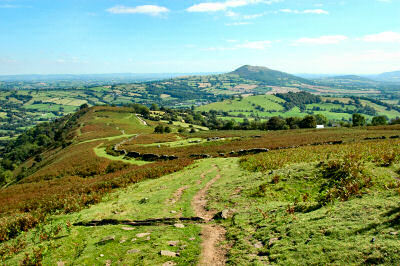 Pen-y-fal (probably better known as Sugar Loaf) where I had walked earlier in the year was visible in the west. The ridge stretched out towards the north. To the north west I could look into the Vale of Ewyas with Llanthony just below. To the east wide views over a fairly flat plain. I then walked off the ridge and followed a path down to Llanthony. 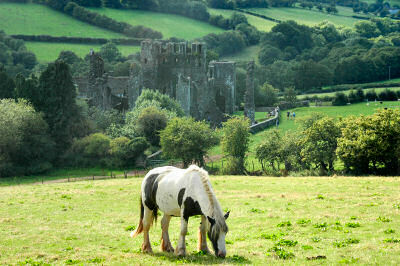 The path led over a field with horses in it, thinking of my sister and her going horse trekking I took a picture of a horse with Llanthony Priory in the background. As it was getting late I didn't stop at the priory for long and soon left again for the return leg. Crossing the Afon Honddu the path took me to the western side of the Vale of Ewyas. Then it was mainly following the path south, passing Sunnybank, Upper Henllan and Noyaddllwyd on the way. Near Ty-ddraenen I changed to the eastern side of the valley, crossing the Afon Honddu for the third time, now walking towards Cwmyoy. It was now early evening, the setting sun providing some very nice light. While not as warm as earlier it was still quite mild. Having passed Cwmyoy I had to cross a number of fields with cows on the way to Strawberry Cottage, but they all seemed to be of the calm type. The final stretch took me back to Great Llwygy, from where I had a nice view of the moon rising over Llanvihangel Crucorney and Ysgyryd Fawr / Skirrid.